BSE Sensex closed higher by 112.78 points, or 0.33%, to 34,305.43, while the Nifty 50 gained 47.75 points, or 0.46%, to close at 10,528.35. Among the sectoral indices on BSE, realty, healthcaere and FMCG gained, while IT, teck and consumer durables declined. BSE MidCap and SmallCap rose 0.34% and 0.56%, respectively. 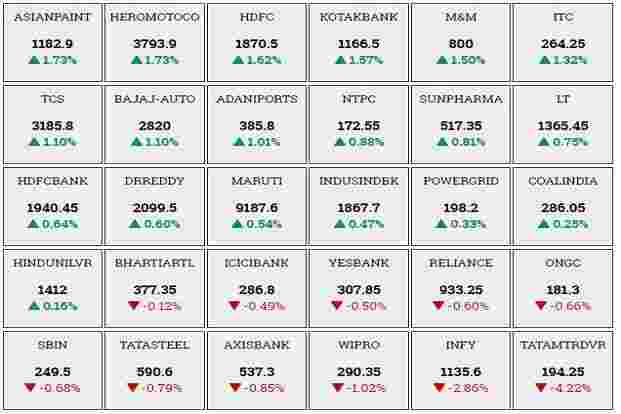 Kotak Bank, Hero MotoCorp, Adani Ports and M&M were top gainers, whereas Tata Motors, Infosys, SBI and ONGC were among the major losers. The Indian rupee on Monday hit a fresh five-month low against the US dollar as nation’s trade deficit widened more than estimated in March. The home currency was trading at 65.42 against US dollar, down 0.30% from its Friday’s close of 65.22. The rupee opened at 65.34 a dollar and touched a low of 65.47—a level last seen on 14 November 2017. Shares of private lender Kotak Mahindra Bank Ltd on Monday beat India’s largest lender State Bank of India (SBI) for the first time to become the second most valued bank in the country. Data from BSE showed that Kotak Mahindra Bank has a market capitalization of Rs2,22,560.69 crore, after its shares rose 1.7% on Monday. Earlier in the day, Kotak Mahindra Bank shares climbed 1.8% to an all-time high of Rs1,170.15 apiece. SBI market capitalization stood at Rs2,22,043.74 crore. Its shares were trading at Rs248.80 on BSE, down 1% from its previous close. BSE Sensex traded higher by 104.37 points, or 0.31%, to 34,297.02, while the Nifty 50 gained 30.75 points, or 0.29%, to 10,511.35. BSE MidCap edged down 0.02%, while SmallCap gained 0.36%. Among the sectoral indices on BSE, realty gained most at 1.68% followed by healthcare 0.92% and FMCG 0.77%. IT was down 0.70%, oil and gas 0.65%, and teck 0.61%. BSE Sensex traded lower by 15.56 points, or 0.05%, to 34,177.09, while the Nifty 50 edged up 3.85 points, or 0.04%, to 10,484.45. ReNew Power Ventures Pvt. Ltd, the largest green energy company in India, will file draft share sale documents with the markets regulator for a $900 million initial public offering (IPO) before the end of the month, three people aware of the development said. The move follows ReNew’s acquisition of 1.1 gigawatts (GW) of renewable assets from Ostro Energy at an enterprise value of around Rs10,000 crore. Steel Strips Wheels Ltd said it has bagged an order for supply of 41,000 Steel wheels for EU Caravan market. Shares were up 0.17% to Rs1215. BSE Sensex traded lower by 82.16 points, or 0.24%, to 34,110.49, while the Nifty 50 fell 15.20 points, or 0.15%, to 10,465.40. BSE Sensex traded lower by 49.43 points, or 0.14%, to 34,143.22, while the Nifty 50 edged down 4.75 points, or 0.05%, to 10,475.85. BSE MidCap was down 0.02%, while SmallCap gained 0.15%. Among the sectoral indices, healthcare, realty and FMCG traded higher, while IT, teck, oil and gas, and energy declined. Sun Pharma, NTPC, ITC and TCS were top gainers, whereas Infosys, Tata Motors, Axis Bank and Tata Steel were among the major losers. HCL Infosystems Ltd said that HCL Insys Pte. Ltd has decided to terminate the sale of its entire investments in its subsidiary namely HCL Infosystems MEA FZE to Axis Investment Inc. after the latter has failed to pay the consideration. HCL Infosystems shares were down 1.47% at Rs53.55. ICICI Securities Ltd shares were trading 1.24% up at Rs427.90. The company on Saturday reported a 91% rise in net profit to Rs159 crore in the fourth quarter of 2017-18, compared to Rs83 crore in the year-ago period. Infosys Ltd shares fell 5.3% to Rs1,107 as investors were disappointed after the company lowered its operating margin band to 22-24% for 2018-19. UCO Bank Ltd shares declined 15% to Rs19.20 after CBI on Saturday booked former Chairman and Managing Director (CMD) of UCO bank Arun Kaul and others for an alleged fraud to the tune of Rs621 crore. Gruh Finance Ltd shares rose 3.2% to Rs 632 after the company reported a net profit of Rs130 crore in March quarter against Rs110 crore a year ago. Where does the buck stop at banks? The latest developments at ICICI Bank and Axis Bank warrants a look at what the Banking Regulation Act has to say about corporate governance at banks. The Indian rupee and Asian currencies on Monday wakened against US dollar amid geopolitical tensions over Syria and trade war concerns. The home currency was trading at 65.38 against US dollar, down 0.26% from its Friday’s close of 65.22. The rupee opened at 65.34 a dollar. Yields on the 10-year government bond stood at 7.413% from its previous close of 7.425%. Bond yields and prices move in opposite directions. 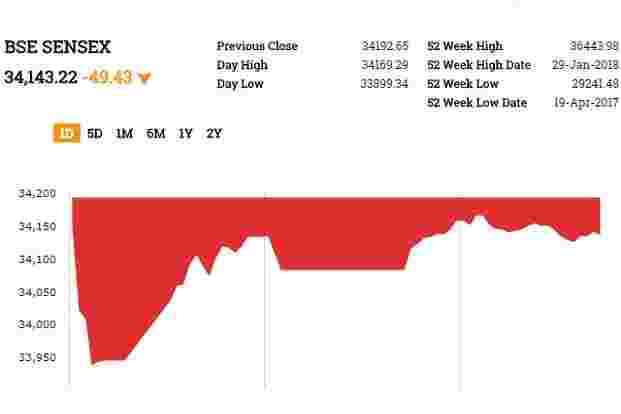 BSE Sensex traded lower by 95.32 points, or 0.28%, to 34,097.33, while the Nifty 50 fell 43.15 points, or 0.41%, to 10,437.45.